We should start out by saying you should always expect the unexpected. We cannot control the weather, nor predict it with 100 percent certainty, so always be prepared for the worst. That’s why we advise our clients, especially those planning events in coastal areas during hurricane season, to hope for the best, but plan for the worst. The National Oceanic and Atmospheric Administration (NOAA) released their 2018 Atlantic hurricane season outlook—which extends from June 1 to November 30, typically peaking in mid-August—and are predicting a 75 percent chance of near- or above-normal activity. An above-average hurricane season this year would follow a devastating 2017 season, which produced a series of 12 named storms. According to data from the NOAA, more than 100 people died due to major storms last year and the events caused an estimated $200 billion in damage. The 2018 Atlantic forecast predicts a 70-percent likelihood of 10 to 16 named storms (winds of 39 mph or higher), of which five to nine could become hurricanes (winds of 74 mph or higher), including one to four major hurricanes (category 3, 4 or 5; with winds of 111 mph or higher). An average hurricane season produces 12 named storms, of which six become hurricanes, including three major hurricanes. “The devastating hurricane season of 2017 demonstrated the necessity for prompt and accurate hurricane forecasts,” said Secretary of Commerce Wilbur Ross. It has long been difficult to predict hurricanes with a high degree of accuracy, but recent technological advancements are making it increasingly easier for NOAA scientists to predict the path of storms and alert officials when an evacuation may be necessary, before the storm even makes landfall. There are several factors the NOAA takes into consideration before putting out this forecast, one of the first being water temperature, since warm water is what typically fuels the development and intensification of hurricanes. 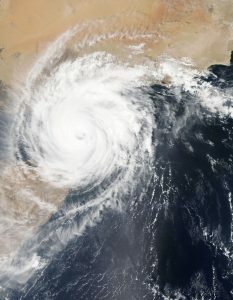 A hurricane forms after a collection of thunderstorms or other weather disturbance pulls warm surface air over ocean water that is at least 80 degrees Fahrenheit. Hurricane researchers note that warm waters in the western Atlantic Ocean and a weaker El Niño may be to blame for an uptick in storms, since El Niño tends to increase upper-level westerly winds across the Caribbean into the tropical Atlantic, tearing apart hurricanes as they try to form. In addition to the Atlantic hurricane season outlook, the NOAA also issued seasonal hurricane outlooks for the Pacific, predicting an 80 percent chance of a near- or above-normal season. The forecast for the eastern Pacific includes a 70-percent probability of 14 to 20 named storms, of which seven to 12 may become hurricanes, including three to seven major hurricanes. The central Pacific outlook predicts a 70 percent probability of three to six tropical cyclones, which includes tropical depressions, tropical storms and hurricanes. No matter where you live, it’s never a bad idea to learn more about hurricane preparedness, including hazards, watches and warnings and marine safety, should you find yourself in a dangerous situation. Now is also a good time to think about the various insurance coverage options available to help you achieve optimum protection against adverse weather conditions this hurricane season. When planning an event near coastal areas during hurricane season, it is imperative that you protect yourself with weather insurance. Even if it does not advance to a hurricane, a tropical storm alone can be enough to cancel or wreak havoc on your event. You can learn more about the 2018 hurricane season forecast on the NOAA website.